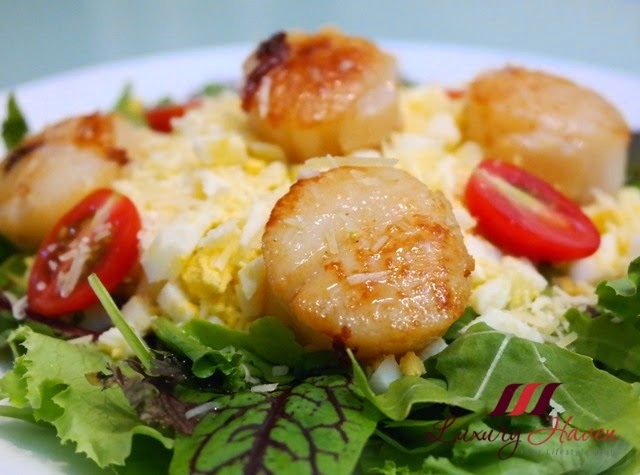 This simple and colourful refreshing salad features plumpy seared scallops on a bed of greens with cherry tomatoes, chopped eggs and grated Parmesan cheese. Definitely a teaser to the palate! I spotted a bottle of Goma (Sesame) Dressing during one of my shopping trips at #Daiso recently. With a price tag of just $2, it's absolutely worth giving it a go starting with some greens, don't you agree? So I pan seared my #Fukuyama Frozen Hokkaido Scallops, and lay them on my salad from Cold Storage with some accompaniments, and drizzled the goma dressing on it. 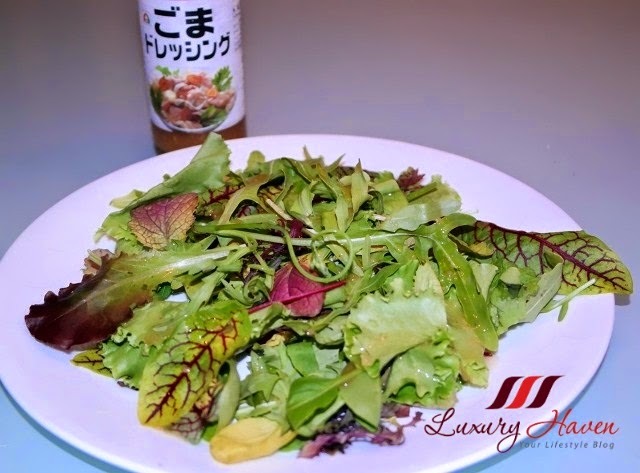 If you enjoy a sweet vinaigrette with with a sour tang, you'll like this uplifting salad! This Succulent Pan-Seared Hokkaido Scallops Salad was part of our 3-course dinner with a Clams and Mussels in White Wine Pot, plus a Champignon Mushroom Bruschetta in Truffle Oil! 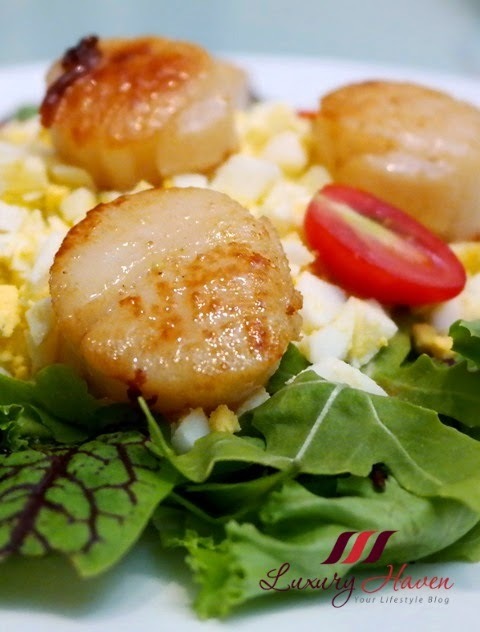 Are you a fan of scallops too? Do you like it done Chinese or Western style? This looks delicious if you like sour tang flavor try apple cider vinegrette. Ooooo yummm... I love scallops! But they are such an indulgence. Even frozen ones are not cheap. Sure am drooling over your dishes! Oh yes, I love scallop! Sesame dressing for just 2 bucks? That's definitely a steal, shall look out for it. DS, a good buy, isn't it?? Hahaha! Ohhh it looks so nice *__* yummy!! Although I have never had scallops Chinese style, Shirley, I'm sure I would love them! Your dinner sounds quite special. I'm sure it was oh so delicious too. I'd love to have this salad alone in front of me right now! Louise, I'll cook for you if there's ever a chance of you visiting Asia :) Thanks so much for your visits & always love seeing you around! 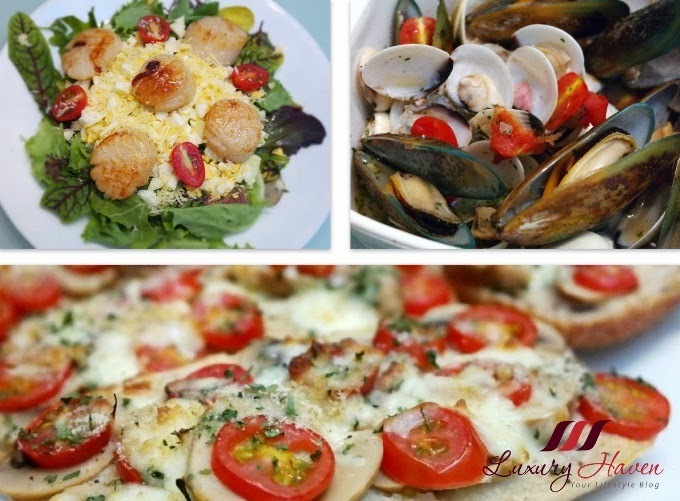 I love scallops....and I think I could eat them prepared any way! Your salad looks wonderful! Liz, my hubby is a huge fan of scallops compared to me. He likes it any style too! Shirley, I love your salad! 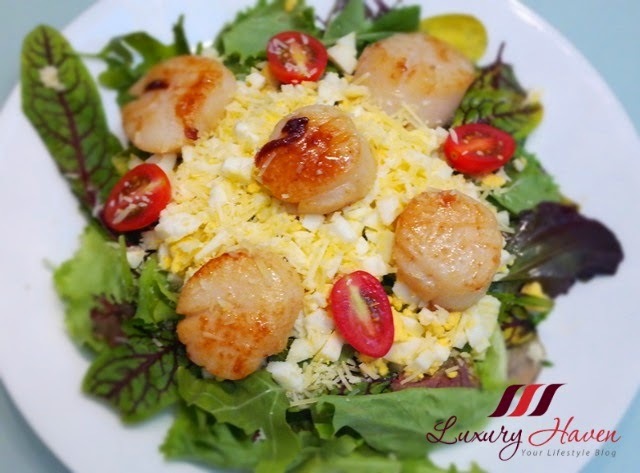 I ought to try scallops in my next salad. Kathy, I'm using frozen scallops. Try it! Heavenly, tasty, delicious and every other word because I'm yearning to taste. Nava, ooh la la! Happy cooking, my dear! 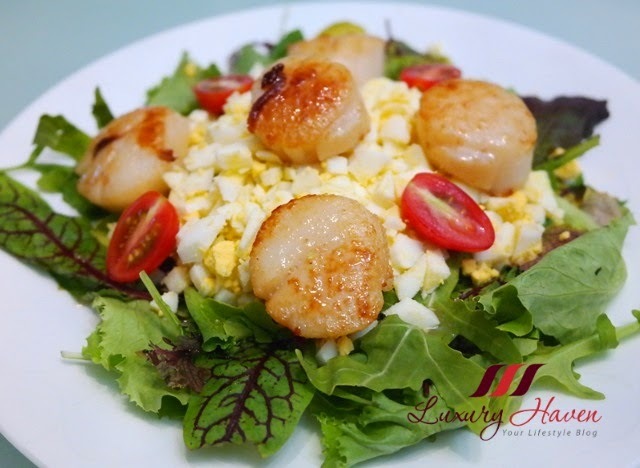 This salad is such a great simple way of enjoying the delicious scallops! I'm a huge fan of seared scallops and my family buys boxes of Hokkaido scallop when they are sales in the supermarket! I enjoy scallops both asian and western ways although I much prefer it asian because we cook it less and the natural flavor is more there such as in a braise, stir fry or soup! Sharlynn, that's a wonderful way of keeping the tabs! Thanks again for sharing your lovely thoughts! Raden, hahaha! Thank you, sweetie! This is so beautiful, Shirley! That dinner must have been special! I would love to follow each other. Please follow me on GFC and I will follow you back. Andrea, thanks for coming by & I'm follow you now! OMG! so yummy. can i have one? Camy, come & grab a bite! this is quite a challenge for me since i'm fasting. hehe. Shirley, the scallops are beautifully cooked. Bet it must be very juicy and delicious. Yee Ling, these Hokkaido Scallops are real juicy!